This year's Sakharov Fellows come from Algeria, Canada, Colombia, Haiti, Iran, Kenya, Morocco, Montenegro, the Philippines, Russia, South Sudan, Turkey, Ukraine and Uzbekistan. They are already strongly engaged in defending and promoting human rights. 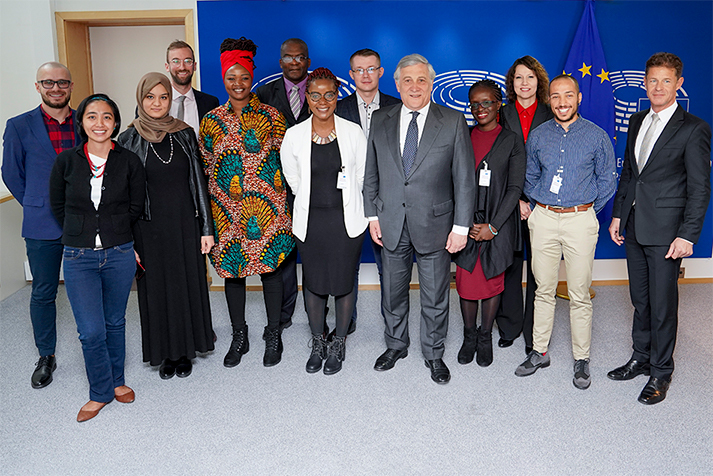 In Brussels (1-5 April), the Fellows meet with European Parliament President Antonio Tajani and Vice-President Heidi Hautala, who is in charge of the Sakharov Prize Network. During their fellowship, they focus on understanding how the EU defends and promotes human rights, and on the mechanisms the EU provides to protect and support human rights defenders. Fellows discuss their human rights concerns with the staff of different European institutions: the Commission, the External Action Service and the Council of Ministers. Fellows acquire insights into how European Parliament human rights urgency resolutions are proposed, discussed and approved. During the week in Brussels, FEMEN activist Inna Shevchenko shared her experience with provocative advocacy action, while Brussels-based NGOs, such as Frontline Defenders and FIDH, explain how human rights organisations interact with EU institutions. Fellows watched MEPs at work when attending a meeting of the Sub-Committee on Human Rights. In individual meetings with MEPs, fellows had an opportunity to practice hands-on human rights advocacy. In two workshops, they were given decisive tools for human rights work such as communication and media outreach, cybersecurity, personal safety and well-being. The fellows also touched base with local human rights work by discovering the roots and success stories of the Belgian LGBTI movement in Brussels' Rainbow House. At the Global Campus Venice School of Human Rights (during the week of 6-13 April 2019), the fellows mingle with a group of international students to enhance their knowledge of human rights law and instruments. They discuss a cover a variety of issues linked to the practical work of human rights defenders. The 2017 Sakharov Prize laureate Lorent Saleh from Venezuela and UN Special Rapporteur on Human Rights Defenders Michel Forst are among the speakers at the opening of the programme. A public roundtable discussion with both is web-streamed. Sakharov Fellows are encouraged to share and spread the knowledge and experience they have acquired in the programme in their home countries. After the two-week training, they can provide valuable input to Parliament's human rights work and help identify opportunities for human rights action in their countries. Strengthening links to local human rights activists and empowering them is part of the European Parliament's broader efforts to support human rights and democracy worldwide. The European Parliament's Sakharov Fellowship offers up to 14 human rights defenders selected from non-EU countries the opportunity to follow a two week intensive training in Brussels and the European Inter-University Centre for Human Rights and Democratisation in Venice. It has been organised annually since 2016 further to an initiative taken by the Sakharov Prize Network at the 25th Anniversary Conference of the Sakharov Prize. In Venice, Fellows will be enrolled in the EIUC's Venice School of Human Rights which combines academic teaching and sharing the Fellow's experiences with an international audience of students in human rights. The aim is to develop knowledge of international human rights law, instruments and mechanisms and how to use these to effect change on the ground. Lecturers include prominent academics, representatives of leading human rights NGOs, Sakharov Prize Laureates, and Members of the European Parliament.